Aaah, what could I say to give this man justice? 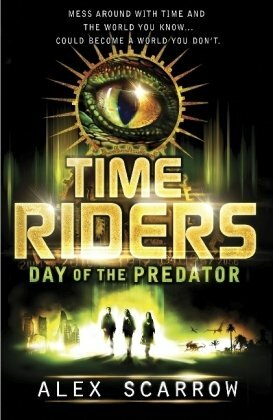 Well, first off and most importantly – he is the author of a series of children’s books called: TimeRiders. Currently there are two books available, with the 3rd coming early next year, and the plan is it will be a 9-book series. W-O-W! But Alex is no novice in the novel universe – having written several books for adults both historical and action-thrillers. Not to mention his brother, Simon, is also very prolific in the adult market of fiction. 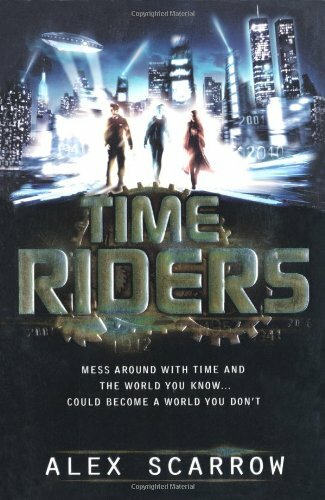 But suffice to say, I’d not really paid much attention to the ‘Scarrow Clan’ until the first of the TimeRiders books hit my shelves. So the opportunity to meet him at the Cheltenham Literature Festival seemed like a must! The main thing I’d have to say about Mr Scarrow is that he has a huge stage presence, and the HSBC Tent really gave him free reign to interact with his audience. Firstly he talked about his previous jobs – Rock musician, Graphic Designer and Video Game think-tank. He mentioned that while none of his ideas for video games ever made it to production; he said it played a pivotal part in his turning to children’s fiction and the TimeRiders series. He then treats us to an amazing music video of his own creation detailing the series. He goes on to ask the audience several probing questions about ‘what ifs’ using various slide-show images. 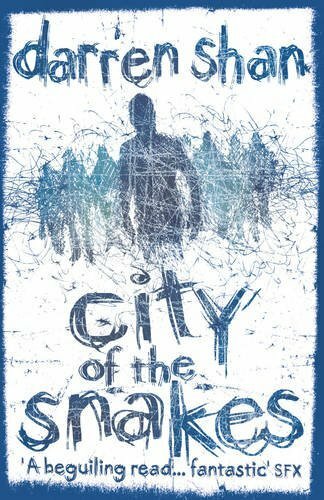 “What if Hitler didn’t invade Russia?” and “What if the dinosaurs didn’t die out?” to some rather surprising and thought-provoking scenes. Alex then treats us to a reading of the very first chapter of book one. The whole room is rapt with attention, myself among them! Afterwards he throws the floor to the audience and the kids are eager, with many hands raised and a lot of bouncing in seats. I had to ask wether he had studied history at all – as it is a huge part of this series. Surprisingly though – he never did! He said he has always had a great love for history, and does indeed read as many books as he can – especially when doing research for each book. He particularly loves being able to manipulate it all as well. Listening to Alex talk about his creation you can clearly see the love and excitement that he has for them. His whole being is animated in fact. There is also talk of film, the rights of which are in discussion at the moment. In conclusion, I think it’s safe to say that this is a series to watch. It’s going to be MEGA! All of these novels have one critical thing in common: They are full to the brim with blood. And so with a full-house – Darren bounds on stage to resounding applause. Right from the first you get the impression that he really is a big kid. With his rosy cheeks and spring in his step, you can tell he loves what he does. After a bit of an introduction he reads from the first book in his Demonata series – Lord Loss. This guy really loves gore and horror. And as he reads from what he says is the goriest scene he’s ever written, the room is deathly silent… and Darren revels in it. He takes great joy in using many-a-scary voices for his characters and the kids in the room are both excited and afraid. Among the various topics he spoke about - he claimed that of all the books he’s published to date, his favourite is The Thin Executioner. 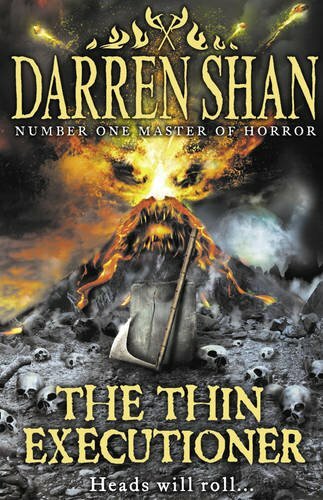 Which, as well as being a book about a young boy who wants to chop off heads for a living, is also Darren’s views and opinions on the current political state of the world. And far from being over anyone’s head, the kids know this and understand it. He then treats us to a chapter to his most recently published novel – Birth of a Killer. Book two of which will be called: Ocean of Blood, due May 2011. Questions are then opened up to the audience with many hands shooting into the air from the minute the floor lights are raised. One of the first questions asked is about the origine of Darren’s love for horror. To which he replies that ever since he was a child he has always loved scary stories and movies – actually enjoying the nightmares they induce! He is of the opinion that every child should be exposed to the dark side of literature and cinema as he believes it is a vital ingredient in growing up. He then ended the event with a reading from a short story used for the World Book Day in 2008 – Koyasan. Well, folks... All I can say is... I'm not dead!! Really, I've been so lazy with this blog, and I do apologise to those of you who follow it. I've been attempting to get myself into gear again, and what with NaNoWriMo coming up in 2 weeks time - a nice spot of blogging may just be what I need to get back into the swing of writing! I've recently attended many events at the Cheltenham Literature Festival - thus will be providing my own reports on each of those (including photos! 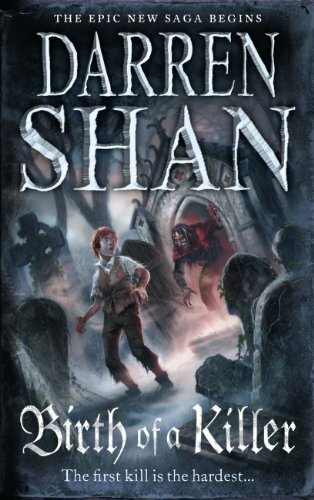 ), so look out for such names as Darren Shan, Alex Scarrow, Lucy Christopher and more! Then there's the book reviews I have been working on, most of which are tied in with the Lit Fest. So, please stay tuned - I should have some more regular updates in the days to come!! I read a lot, I drink a bit, I work too much and I might be a bit odd.